Lubyansky Drive, Moscow, Metro station: "Kitay-Gorod". During Soviet times, the chapel in Ilyinsky Square seemed to be a strange monument of far-off years. It was a real miracle that it remained standing there between the buildings of the Central Committees of the Communist Party and Komsomol. There was hardly anyone who could remember the words said by Lieutenant Colonel I. Sokol on the opening day: "Let this monument, erected by grateful Grenadiers in honour of their fallen friends, remind the next generations of every year and every century how native sons can fight for the honour and glory of their Motherland when they are inspired with faith and boundless love for the Tsar and Homeland." The Memorial Chapel to the Hero Grenadiers who fell in battle near Plevna was built on the initiative and charitable contributions of surviving grenadiers: the Siege of Plevna combatants. 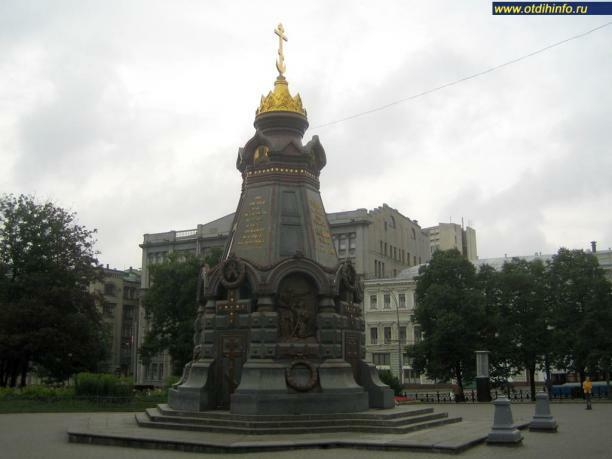 The monument's construction was supported by the entire Russian society, who perceived the Russo-Turkish War of 1877–1878 as their solemn duty to protect fraternal peoples of the same faith. The Plevna Chapel was opened on 27 November 1887, the 10th anniversary day of the heroic Siege of Plevna. The project's architect was the famous academician Vladimir Sherwood. The Chapel's interior was adorned with abundant ceramic decor covering all surfaces. Near the main icons of St. Alexander Nevsky, St. George and St. Nicholas, unquenchable hanging vigil lights burned. The evidence handed down to us, preserved 'til our days, reflected stirring moments of that really nationwide, all-Slavic celebration. Before the Chapel was consecrated, a military parade was held that included twelve battalions of various combat arms and four squadrons of the Moscow Garrison. The Field Marshal Grand Duke Nicholas Nikolaievich the Elder, the Commander of the Russian Army of the Danube, reviewed the troops. The celebration was visited by the Moscow Governor General Vladimir Dolgorukov, all members of the City Council and representatives of the Moscow military class. The entire area around the Chapel, from the street and square, was full of people. At the moment of the Plevna Chapel's consecration, a religious procession brought to the Chapel the greatest relic of Moscow: the Iberian icon of the Mother of God. A holy water service was led by the Metropolitan of Moscow, Joannicius, who dedicated the Chapel to priests from all Grenadier regiments and to the signing of the Synodic Chorus. When proclaiming the Immortal Memory to the fallen soldiers liberating Bulgaria, the names of Emperor Alexander II the Liberator and Sergei de Beauharnais, Duke of Leuchtenberg, who was killed near Plevna, were remembered. At the close, it was announced that the Chapel was handed over to the city of Moscow and willed it to cherish the memory of the fallen soldiers and pray for them every 28 November, the day of battle. Moscow citizens had always solemnly celebrated the bequeathed Memorial Day. However, the hard times of the 1917 Russian Revolution swept away many dear things. The Chapel was closed and devastated. The authorities tried to destroy it under the Central Committee order, but it was saved by a miracle; its disfigured appearance reminded all about the evil-doings the Russian Church had undergone. Mad vandals relieved themselves inside. It was apparently then that the Grand Crucifix, kept in the Chapel and later moved to the Kadashi Resurrection Cathedral, was abused. Somebody's aweless hand maliciously scratched out the eyes of Christ. Today, this Cross reminds people not only of the Passions but also of those parlous times when the Church was persecuted. The disfeatured Chapel stood 'til the mid-1940s, when the state appealed for support of the Church during the dangerous times. By the end of World War II, the Chapel was cleaned up, the Cross was reconstructed and the inscriptions were plated with gold. In the late 1950s, the Chapel was completely covered with a preservative compound and took the form of the black cast-iron monument well-known by every citizen of Moscow. On 3 March 1990, on Bulgaria Independence Day, Metropolitan Juvenaly held a service for the soldiers who fell liberating Bulgaria from the Ottoman overlordship. The service was concelebrated with the clergy from the Bulgarian Town Church in Moscow. The Russian people should do justice to the Bulgarians since they, feeling gratitude to the Russians, laid wreaths on the monument every year on the day of the Plevna Siege. The Chapel had not been returned to the Russian Orthodox Church for long. The Society of Orthodox Culture Adherents initiated the transfer. In December 1992, the Chapel was finally transferred to the Church and assigned to the Nikolo-Kuznetsky Church. We should mention some of the miraculous coincidences that occurred. Vsevolod Spiller, a highly honoured archpriest who lived as an emigrant in Bulgaria before coming back to Russia, was a rector of the Nikolo-Kuznetsky Church for a long time. On 10 December, the Our Lady of the Sign icon and the Blessed Prince Vsevolod-Gabriel, an archpriest with the same name, are commemorated. All these signs encouraged a small group of enthusiasts, led by Professor D. Zarudny, a chairman of the Society of Orthodox Culture Adherents. The Society strived for the Chapel to be transferred and wanted to revive its beauty and importance in Moscow spiritual life. Patriarch Alexis gave his blessing to the creation of the Board of Guardians to restore the Memorial Chapel. The Board was headed by Archpriest Alexander Saltikov, a confessor of the Society of Orthodox Culture Adherents. Since 1993, the Society's absolute priority has been the renewal of regular church services in the Chapel on Memorial Day for warriors who "gave up their lives for the Church and Motherland". In 1998, the 120th anniversary of Bulgaria's liberation and the signing of the Treaty of San Stefano were symbolic for the Chapel. On 1 March, Forgiveness Sunday, the Memorial Chapel was consecrated and opened. His Holiness Alexis II, Patriarch of Moscow and All Russia, attended the event. On 3 March, Bulgaria Independence Day, the clergy of the Russian and Bulgarian Orthodox Churches solemnly commemorated the warriors near the just consecrated Chapel. The Bulgarian Embassy, representatives of the Ministry of Inner Affairs of the Russian Federation, the government of Moscow, officer personnel of the Moscow Military District, the Military College and the general public attended both occasions. The Ministry of Defence of the Russian Federation and the Bulgarian Embassy laid wreaths. On the 121st anniversary of the Siege of Plevna, 10 December 1998, commemoration of the grenadiers, being traditional for Moscow then, took place near the reconstructed Chapel, which was ablaze with a golden cross. Before the various military corps formed in the square, representatives of the Bulgarian Embassy and general officers passed a company of ceremonial troops doing honour to the fallen grenadiers to the accompaniment of a military band. They laid wreaths on behalf of the Bulgarian Embassy and the Moscow Military District. After that, a service for the dead was held. Bishop Alexis of Orekhovo-Zuyevo, Bulgarian ambassador Vasil Takiev, representatives of the Moscow Government, the Ministry of Defence and non-governmental organisations said wonderful words saturated with solidarity and grateful memories to the fallen grenadiers. In December 1999, taking into account the monument's significance and its role in the rebirth of the Orthodox army, His Holiness Alexis II, Patriarch of Moscow and All Russia, took over the control of this great martially sacred place and established his town residence under the Chapel. In 1999, NATO's planes bombed Yugoslavia's (Russia's fraternal nation) cities and towns, destroying not just the country's infrastructure but also ancient Orthodox sacred things. During these hard times, every week many people prayed and remembered the innocent victims in the Plevna Chapel. Today, it is a good tradition to regularly pray for the repose of the departed souls at this place. For the last several years, services for the Russian grenadiers who fell in Plevna while unyoking the brotherly Balkan nations from the Ottoman Empire have been solemnly held near the Chapel.